Leinster scrum coach Marco Caputo on the task facing the Irish front row against England on Sunday. Caputo thinks Healy can get on top of Cole this Sunday. THE IRISH FRONT row has the kind of strength in depth that fans dreamed about for years, with Joe Schmidt having the luxury of top class replacements on both side of the scrum regardless of which combinations he goes with. In Joe Marler and Dan Cole England have two powerful scrummagers so it is just as well that Schmidt might be able to call on Cian Healy and Marty Moore in the second half. Earlier in the season Marler dominated Mike Ross home and away in the Champions Cup back-to-backs and the veteran tighthead was left out of the Leinster match-day squad for the final two pool fixtures in favour of Moore and Tadhg Furlong. Leinster scrum coach Marco Caputo was impressed by Ross’ two displays so far in the Six Nations but stressed that there isn’t an established pecking order of Moore, Furlong and Ross at the province. He also commended Ross’ attitude in the analysis sessions after being omitted from the Leinster team for those European fixtures and thinks how the Corkman performs will go a long way to deciding Sunday’s game. “I don’t see that we have a pecking order,” Caputo said. But while Marler might have an edge on Ross, Caputo reckons that one of the national team’s returning stars knows how to neutralise the threat of England’s Cole. Cole won a lot of penalties against Gethin Jenkins in round one but Caputo thinks that Healy’s experience in playing against the Leicester man will be crucial at the Aviva. “Front rowers always have a nemesis who they have problems with and if you look at Cian Healy, he has had some pretty good days against Dan Cole,” Caputo said. Leinster travel to the Ospreys this Friday night after a mixed two-week period, losing to the Dragons at the RDS before just about getting a bonus point win against Zebre at home last Friday. Since Leinster have a host of players in the national squad there is obviously a lot of disruption but since they often don’t know which players will be involved with Ireland until late in the week, it can be hard to nail down a starting 15. “We’ve got 18, 19 players going away this afternoon to Ireland camp,” Caputo said. 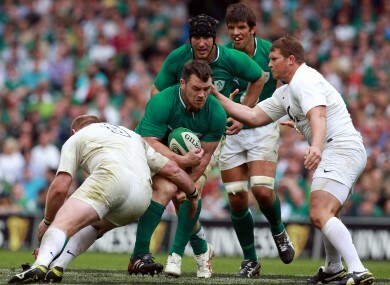 Email “'Front rows always have a nemesis and Cian has had some pretty good days against Dan Cole' ”. Feedback on “'Front rows always have a nemesis and Cian has had some pretty good days against Dan Cole' ”.